Should You Blanket Your Horses In Winter? Blanketing your horse is one of those things that people just can’t seem to agree on. Many people who think all horses should be blanketed will often talk about the “poor horse” covered in snow. Most horses can go with or without a blanket with no issues. Making that decision, should be based on a number of things. Most horses are fine, even in the coldest weather, without a blanket. When they are used to winters in your area horses will grow a winter coat that will keep them safe and warm. Even in the coldest weather they will be safe as long as they have adequate shelter from the elements. Some horses, however, require a blanket over the winter for both comfort and health. Rescue horses are one category of horse that should be given a blanket for the winter. Horses that are malnourished have a harder time maintaining their weight in the best of times. These horses often have thin, poor quality coats. This makes them unable to maintain heat like a healthy coat. Without a blanket, the horse spends extra calories trying to keep the horse warm and alive. This slows their weight gain and can set rehabilitation back. Show horses that have been clipped are another example of horses that should be blanketed over the winter. Since their winter coat is shaved off, they have little to no natural protection from the elements. Other horses, such as those that are not used to cold weather or those that are commonly blanketed, should also be given the courtesy of a blanket. They will often not grow a full winter coat leaving them very cold without one. When blanketing horses, you should remember that it is all or nothing when it comes to blankets. If you plan on having your horse go without a blanket all winter, do not give them one in the fall. It will cause their coat to come in thinner, and they will be unprepared for the colder weather. You should also remember to remove the blanket on a regular basis and groom your horse thoroughly. Not only does this increase your horse’s circulation and feel good, but it also prevents moisture build up under the blanket. This moisture build-up can lead to horrible skin conditions. You will want to make sure that you have a blanket that is appropriate for the temperature and moisture levels that your horse is exposed to. 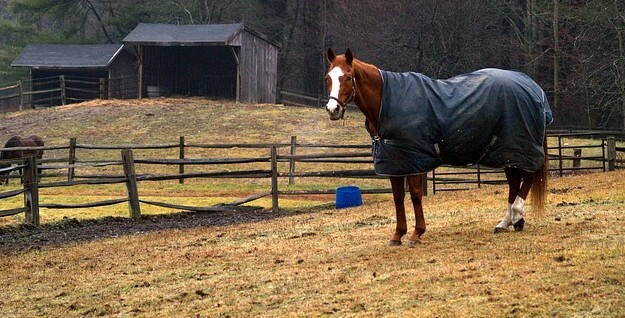 If you have your horse in a barn, a winter rug without waterproofing is often acceptable. Should they be outside this will quickly get saturated with water and be extremely detrimental to your horse’s health. You also do not want a heavy blanket on your horse while the weather is relatively warm. You only need a light blanket if your weather stays above 30ºF. Any colder than that and you will want to make sure you have a heavy blanket for the colder days. Again, in most cases, blanketing is a personal choice and many horses are fine with or without. In cases where blanketing is needed, however, make sure that you have one available for your horse that fits properly, is in good condition, and is appropriate for the weather your horse is exposed to.